We already know that Windows 10 runs on more than 300 million devices worldwide. 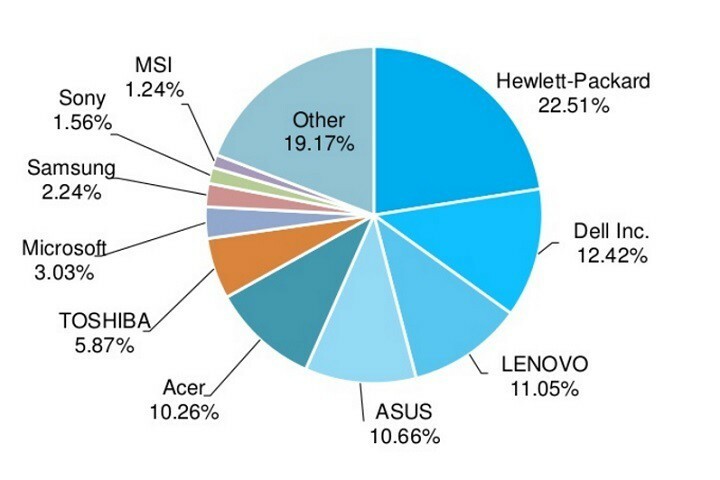 Now, thanks to AdDuplex, we also know who the most popular Windows 10 PC manufacturers are. HP dominates by far the Windows 10 PC sales with an impressive 22.51% market share. Actually this article was written using a reliable HP ProBook laptop. DELL takes the second place with a satisfying 12.42% market share, followed by Lenovo with a 11.05% market share, Asus with 10.66% and Acer with 10.26%. Microsoft’s Windows 10 PCs have only a dim 3.03% market share. However, Microsoft’s Surface devices are not intended for the general usage, they are premium-devices that mainly target professional users. Although the 3% Market share may seem extremely low at first sight, the Surface division brings quite a lot of money to Microsoft’s treasury. Actually, in Q1, Surface revenue increased 61% in constant currency driven by Surface Pro 4 and Surface Book, with many customers preferring to purchase a Surface Pro 4 device over an iPad Pro. HP’s success can easily be explained by the large variety of computer models it offers. The company has covered all market segments, from low-end cheap computers, to high-end devices. For example, last month HP unveiled a series of new entry-level Windows 10 laptops all of which come with bold colors and budget pricing. With these laptops, the company is preparing itself for both the summer and the back to school seasons, and brings new laptops under the budget friendly Pavilion brand. If you’re a gamer and you want a real powerhouse, HP has an interesting offer for you too. Its new OMEN gaming computers come with features such as 4K IPS Full HD displays, Intel Core i7 quad-core processors, and powerful NVIDIA GTX graphics cards, allowing you to play the latest games at full details without any problems.